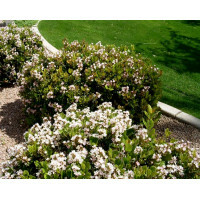 Snow Maiden is an evergreen shrub with a compact and upright habit. It has stunning shiny dark green leaves and beautiful pure white flowers in winter and spring. The leaves are a bit smaller than most Raphiolepis varieties. Grows in full sun to part shade but produces more flowers when planted in full sun. Snow Maiden tolerates most well drained soils as well as second line positioning in coastal areas. It’s also frost tolerant. Grows to 75cm high and 50cm wide. A truly low maintenance plant. Fertilise in spring and prune to shape once flowering has finished. It is relatively pest and disease free too. Rhaphiolepis Snow Maiden is a fabulous, hardy plant suitable to most landscapes. Ideal for mass planting, hedging, borders and pots. Add it to your next garden design. 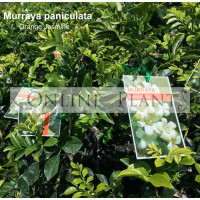 Buy Raphiolepsis snow maiden plants from Online Plants - leading plant nursery Melbourne offering Australian wide delivery. We deliver to all Melbourne, Sydney, Adelaide, Canberra and Brisbane, metropolitan and regional areas. Tough, white flowering shrub useful for both domestic and commercial sites. Flowering bigger and pre..